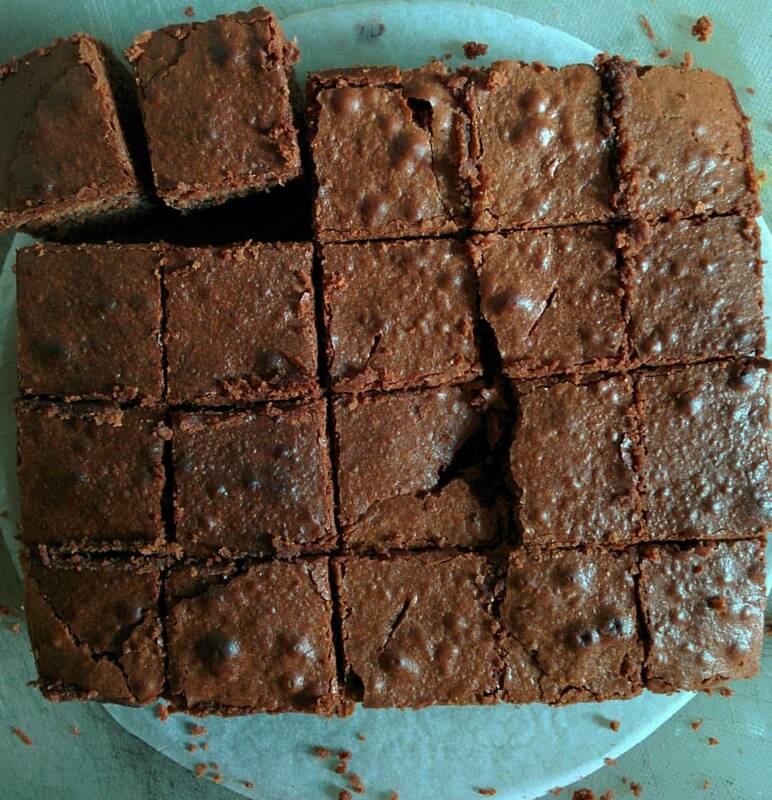 I baked my first batch of brownies when I was working at WAT Consult way back in 2011. Fresh out of college, my new job was at a young social media agency and to break the ice, I cooked food for the entire team. First was a Mangalorean classic chicken curry with enough neer dosa to feed an army. Akhil called it ‘sambhar chicken’ for some reason. After that, I baked brownies because I had a stash of cocoa powder I needed to finish. That first batch started off my tumultuous love affair with chocolate brownies. I’ve tried all types of chocolates, cocoa powders, and even went to the extent of adding cookie dough to it (failed big time) and sobbed over the sink, scraping damn cookie chunks from the bottom of the tin (Vim does not work). Zeroing down to this specific recipe made me intensely happy because it happened on my birthday this year. After playing around with different proportions, I finally decided to go equal parts butter and chocolate. I chose 70 % dark chocolate to get that intense flavour and added this rich molten chocolate to hand whisked sugar and eggs. I mention hand whisked because when you beat it with an electric whisk, you incorporate a lot more air into it. A brownie doesn’t need to rise like a cake and that air makes it rise. I use a small hand whisk that doesn’t have a very slow function so I just bring out my trusty balloon whisk to do the job. It’s a bit of a workout but you’re going to eat those rich brownies anyway! If you have a stand mixer like a kitchen aid, go ahead and use it. So if you’re whisking by hand, whisk till the sugar has melted and the mixture looks pale yellow. When using a stand mix, start at medium speed to bring it together and switch to full speed for two minutes. Then bring it as low as possible to add chocolate and flour. Enough of this suspense; here is my recipe for chocolate brownies that will yield the most intense, fudgy brownies. Before you begin, make sure all your ingredients are at room temperature. Pre-heat the oven to 180 degrees Celsius. In a baine marie, melt the chocolate and butter. You could even blast it in the microwave till you get a smooth, lump-free mix. Let it cool completely. Slowly add the cooled butter-chocolate mix to the sugar-egg mixture and mix well. Tip in the sifted flour and fold it to a smooth batter. At this point, you can add nuts of you like. Pour this batter in your prepared tin and smoothen the top with your spatula. At this point, you can add fresh berries (raspberries work best). Bake for 30 to 40 minutes. Let it cool completely before removing from tin. Allow to cool for some more time before cutting into squares. Hello! I'm Anisha and I'm a writer and traveller. I love experimenting in the kitchen and document everything on my plate. Welcome to my life.